We bid goodbye to March and Ireland as we begin April Backpacking Coast to Coast in Iceland with a grand Góðan daginn. We are going to follow in the tracks of our authors of the month - Arnaldur Indriðason and Yrsa Sigurðardóttir - as well as learn about Iceland's bookish history. Plus spend some time exploring Reykjavik’s bookstores and the National and University Library of Iceland. Watch and listen to what writers Sjon and Magnason have to say on how Iceland inspires their creativity. Check out the long list of nominees for the International Dublin Literary Award 2018 as the shortlist will be released on April 4th. Icelandic Literature Center's From Sagas to Novels talks about how authors have made the world their subject. Get ready for your armchair travels with What to read before going to Iceland, books set in Iceland as well as Goodread's long list of Popular Icelandic Authors. Our flower of the month is part of the Rosaceae family - the Mountain Aven - which is Iceland's national flower. 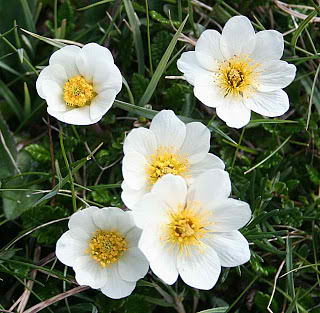 Also called the Dryas octopetala. In Icelandic, the name of this species is both Holtasóley and Hárbrúða. For this month's Blossom Bookology challenge, you need only spell out AVEN. If you wish to challenge yourself, you may choose to spell out any of the related words. For our Brit Trippers, the next leg of our trip runs along Dere Street starting in North Yorkshire. Dere Street runs north towards Scotland and the Romans used it as a travel route for their legions stationed on the borderlands and on Hadrian’s Wall. Lots of things to explore in Yorkshire from the beautiful scenery to animals and authors including James Herriot. Have fun following armchair traveling through Iceland and following rabbit trails! Hello dear hearts. I'm currently have Last Rituals by Yrsa Sigurdardottir as well as Michael Ridpath's Far North in my virtual backpack to read this month.